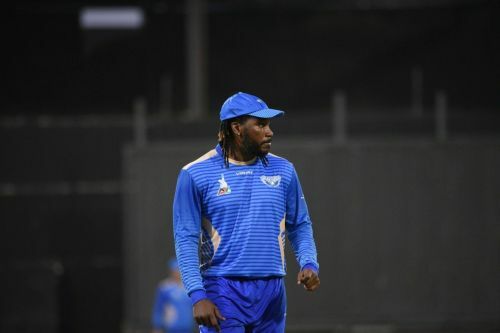 Will Chris Gayle help Balkh Legends to book themselves a birth for the finals? So, here we are at the business end of the Afghanistan Premier League 2018 that has been a real feast for cricket fans. After 14 days, 20 matches, and some extraordinary performances, the semifinal stage is set to kick-off from today with a game between the table toppers Balkh Legends and the rejuvenated Nangarhar Leopards. It will be the third meeting for Balkh and Nangarhar in the APL 2018. In the first game between them, Balkh turned out to be triumphant as they closed the match by 25 runs. Meanwhile, in the second game, Nangarhar turned the tables around as they won the encounter by six wickets. Thus, with a knockout affair on the cards, the Balkh-Nangarhar is expected to be a close fought affair with the game going in the penultimate over. Balkh Legends have had an extraordinary tourney under the captaincy of Mohammad Nabi in the ongoing APL 2018. Having won six out of their eight league games, Balkh Legends finished the league stage as the highest ranked team. With Chris Gayle coming back to the party, Legends' batting has been following an upward curve. One such episode happened in their last league game where Gayle smashed 73 runs off just 22 balls while chasing a target of 142. Besides Gayle, they have got decent batting support in the name of Colin Munro, Ryan ten Doeschate, and Mohammad Nabi. Legends' bowling has been on the same lines as well. With an excellent mix of capped and uncapped players, Legends call for one of the most versatile bowling lineups in the tournament. Mirwais Ashraf and Gulbadin Naib have been the pick of their bowlers. Thus, with a nicely poised team, Balkh Legends will look to unsettle Nangarhar Leopards while cruising to the finals of the first ever APL. Probable Playing XI for Balkh Legends: Chris Gayle, Colin Munro, Darwish Rasooli, Ryan ten Doeschate, Ravi Bopara, Mohammad Nabi (C), Ikram Ali Khil (WK), Gulbadin Naib, Mirwais Ashraf, Qais Ahmad and Aftab Alam. Meanwhile, Nangarhar Leopards have had a bit of inconsistency in APL 2018. Having won three out of their eight league games, Nangarhar Leopards finished the league stage on the fourth position while just qualifying for the semifinals. Nangarhar Leopards have possessed an immaculate batting lineup with some T20 specialists in their squad. Despite that fact, Leopards have been unable to fire consistently with the bat. They have faced both the highs and the lows quite consistently which has been the reason for their inconsistent batting. Bowling hasn't been any different. However, they have performed considerably well with the ball. With the likes of Mujeeb Ur Rahman, Ben Cutting and Zahir Khan, Nangarhar Leopards have done a fair job in their bowling department. Nonetheless, they will have to build upon consistency levels. Thus, with potential batting and bowling lineup, Nangarhar Leopards will look to forget their performances from the past with an eye on the final's birth. Probable Playing XI for Nangarhar Leopards: Andre Fletcher, Anton Devcich, Johnson Charles, Rahmat Shah, Hashmatullah Shahidi, Shafiqullah Shafiq (WK), Ben Cutting (C), Naveen-ul-Haq, Mujeeb Ur Rahman, Zahir Khan and Fazal Niazai. With overpowering batting strength and more than good bowlers, Balkh Legends hold an upper hand against Nangarhar Leopards in today's game. Besides, Legends also rank high on the consistency levels. Thus, Balkh Legends are expected to be a tough nut to crack for the Nangarhar Leopards. However, since the Leopards came out at the top in their last encounter against the Legends, they might just go on to cause an upset an advance through to the finals as they have the momentum with them. Expected top performers for Balkh Legends: Chris Gayle, Gulbadin Naib, and Mirwais Ashraf. Expected top performers for Nangarhar Leopards: Andre Fletcher, Ben Cutting, and Mujeeb Ur Rahman. Final Prediction: Considering the current form and the overall team balance, Balkh Legends are expected to cruise to the finals while upsetting the final's dream of Nangarhar Leopards.